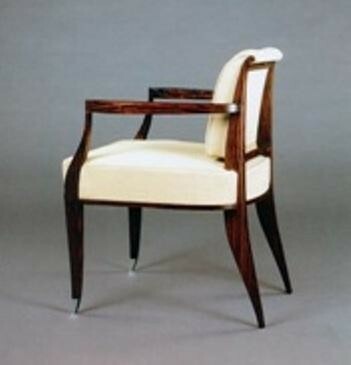 This dining chair is originally designed by Ruhlmann and this is a photo of one in Macassar Ebony. The low back and deep seat make these chairs unusually different from what is currently available in chair design today. The depth also adds another dimension in comfort. We have made a number of these for clients. All in dark walnut finish. The chair can be upholstered in different ways. Some have been upholstered with a thin back that graduates at the base and some have been upholstered with a thick roll over top. They look stylish with either piping or studs. The front two legs are ideally always finished with two sabots in either bronze or nickel.